Standing next to the north-westerly coast of Peru and alongside the Sechura Desert, Piura is a relatively isolated city and characterised by its hot summers, narrow cobblestone alleys and neighbouring beaches. Despite its desert setting, Piura has irrigated much of the land and now enjoys a thriving agricultural industry, with crops including both cotton and rice. Tourism in Piura is on the up, with many sights being based along the Jiron Lima, where the colonial character is undeniable and a number of magnificent churches reside, such as the Iglesia de San Francisco. Just one block away and to the north-west, the Plaza de Armas is home to the city's very own tourist information office (Centro de Promocion Turistico). Home to a number of spacious public squares, green parks and bustling markets, the tourist attractions of Piura are easy to find. 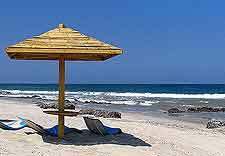 However, it is the nearby beach resorts of Colan, Mancora and Punta Sal that tend to attract the most holiday makers, particularly when the Peruvian sun is shining down during the hot summer months of both January and February. Nunura Beach is also rather popular and is known for its favourable surfing conditions. Within Piura city centre itself, innumerable places of interest surround the Plaza de las Tres Culturas and the Plaza de Miguel Cortes, with the Cine Planet cinema complex being nearby and off the Plaza de Armas. 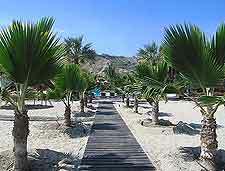 More information about Piura Tourist Attractions. 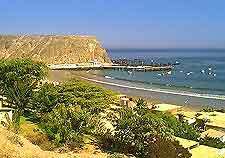 Over the years, the city of Piura has actually moved around a few times before settling in this spot in the late 16th century, and was once sited in Sullana and again on the coast of Paita. 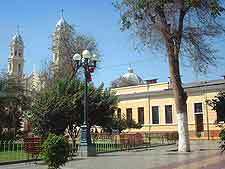 Dating back more than 400 years, the Spanish-influenced Piura Cathedral is amongst the city's oldest structures still standing and somewhat dominates the Plaza de Armas, as does the Freedom Monument. The Iglesia de San Francisco is another important church in the city and enjoys a riverside setting next to the Rio Piura, while the city's considerably more modern university complex also warrants a mention and was founded just over 40 years ago. More information about Piura Landmarks and Monuments. Filled with information about the Piura Region and its extensive history, the city's museums may not be plentiful, but are certainly a cultural highlight. In particular, the Museum of Gold (Museo de Oro Vicus) is one to look out for and is filled with priceless golden treasures. The Piura National Institute of Culture also offers a flavour of the city's pre-Hispanic past, concentrating on the civilisations known as the Vicus and the Talláns. For a taste of local art, the Religious Art Museum (Museo de Arte Religioso) on the Jiron La Libertad is of note. More information about Piura Museums and Piura Art Galleries. A number of possible day trips present themselves to tourists based in Piura and for some, the vast expanse of the Sechura Desert beckons. Especially close by in the town of Catacaos, which is just a matter of minutes away to the south-west and ideal for day trippers, boasting a riot of local 'picanterias' (Peruvian restaurants). To the south-east, the Reserva Ecologica Chaparri is rich in native wildlife and this huge nature reserve is well connected by bus tours. Those who fancy checking out some different beaches outside of Piura will no doubt find the allure of Mancora, to the north, hard to resist. Others may prefer to explore the lively market stalls at Chiclayo's Mercado Modelo, to the south, and off the Pan-America Highway, or further away, the archaeological site of Chan Chan, near to Trujillo. 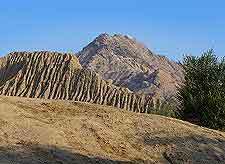 Closer to home are the Sican remains of Tucume, and the pre-Inca ruins of Tumbes, both of which warrant a little time at the very least. 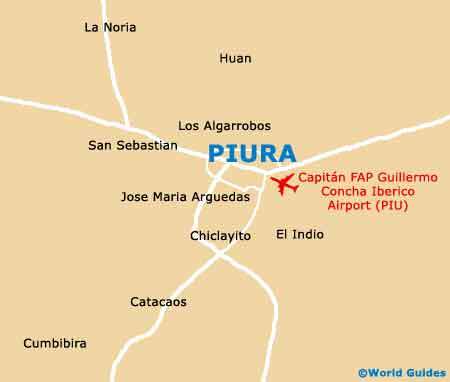 More information about Piura Attractions Nearby.